Where does the time go?! I mean, seriously? Last year was busy, really really busy. I didn’t get to do half of what I had set out to do, so 2015 is the year to revisit my list of goals. And with a vengeance! I’ve never tried a New Years Resolution, because I honestly don’t think that I’d stick to it. I personally do better with small, attainable goals, with an end in sight (and a reward never hurts). So, I keep my calendar close by to fill with my goals, track them and most importantly, check them off. I love the feeling of checking something off of my list, because that means that I’ve accomplished something. And that’s a reward in and of itself! Amiright?! I prefer to write on a paper calendar because I love the way the ink flows across each page AND I get to actually put a big X next to each completed goal. *sigh* Last year I found my 2014 spiral and desktop calendars at Target via Sugar•Paper Los Angeles. I instantly fell in love with the look, feel and function of these beauties. So, last November I set out on the hunt for a 2015 set. To my surprise, Target had them in stock, again. Yay!!! It really is the little things that I look forward to each and every day. The spiral calendar that I like is 8 1/2 x 11 in., so I carry it in my Nixon bag, which I also loooooove very much! Basically, it’s a mini system that works perfectly in my life. I can never find the calendars that I like on the Sugar•Paper website, but they do have some other really nice items on there. High quality stuff. But check your local Target to see if they’re in stock. 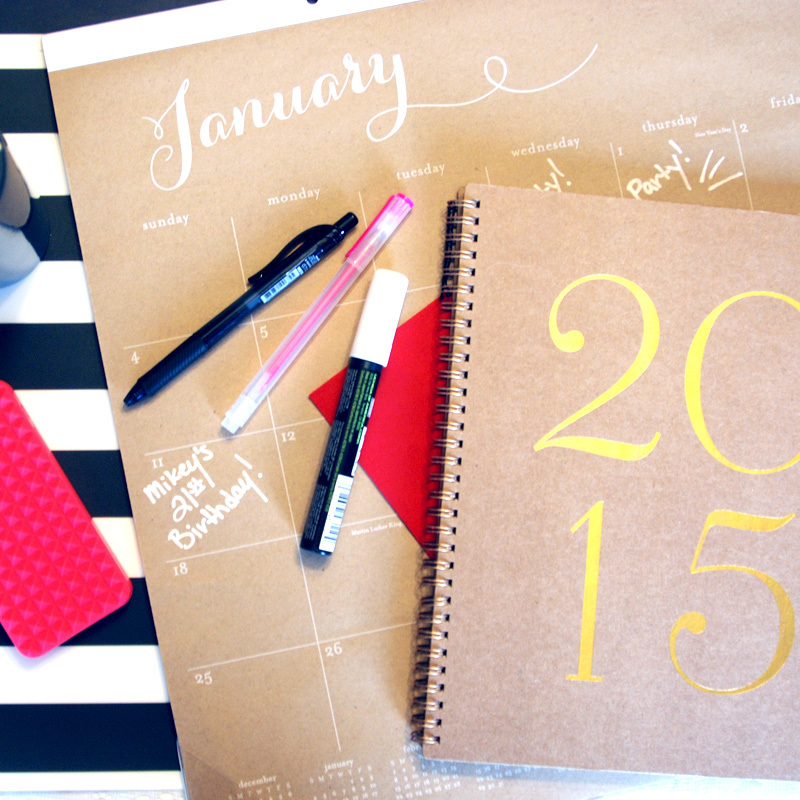 So, I’m going to finish writing in the rest of my 2015 goals and hope that your year is off to a great start! Here’s to New beginnings!